DYNATUNE-XL does offers also "Longitudinal Dynamics Tools". Two highly efficient tools have been developed for those people that need to modify their gear ratio's and get the best acceleration package with their available engine or want to improve/design the braking system and verify it's performance. The tools have recently been added to the product portfolio and are focused - as all DYNATUNE-XL tools - to deliver a maximum of information with a minimum of required input data. Both tools are based on MS EXCEL ® workbooks and do only use standard workbook functions for all calculations (without any additional VBA code) and are therefore fully compatible with all Version of MS EXCEL ® from 2007 onwards. In the Drive Line Module most important data to be supplied are Engine Torque Map - either directly measured on an Engine Dyno or to be generated out of measured Power at the Wheel Data - as a function of RPM and Gearbox Ratios & Final Drive. 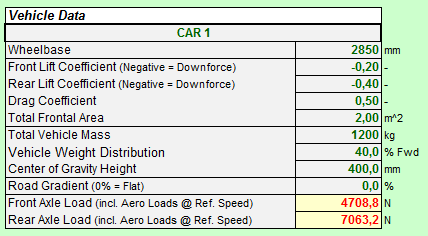 The tool allows to calculate two vehicles and compare their key performance characteristics. The Gearbox allows from 5 to up to 8 gear ratio's to be specified and can thus simulate the most commonly used (manual) gearboxes for automotive/motor cycle applications. 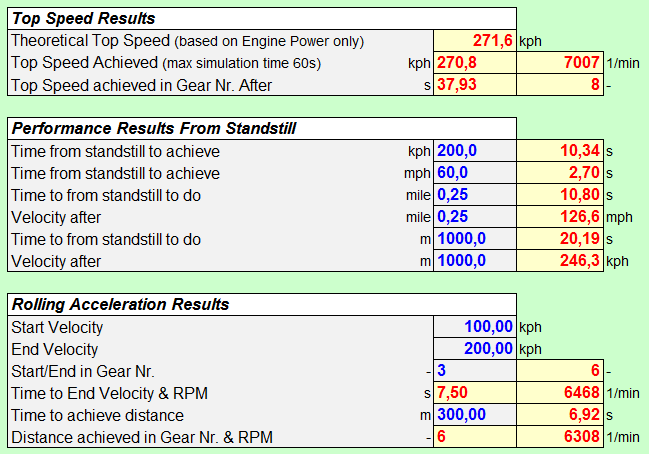 Shifting time can be entered in steps of 0.01 sec and the Power Train Architecture can be varied from FWD to AWD to RWD by 1 Parameter indicating the percentage of Torque transferred to the Rear Wheels. NOTE: Drive Line Inertia Data are currently not considered. Together with the most important vehicle data, like Vehicle Mass, Weight Distribution, Aerodynamic Data and Tire Grip a typical Gear Ratio / Engine RPM - Velocity Chart provides at the blink of an eye the most important information about the Drive Line Layout. 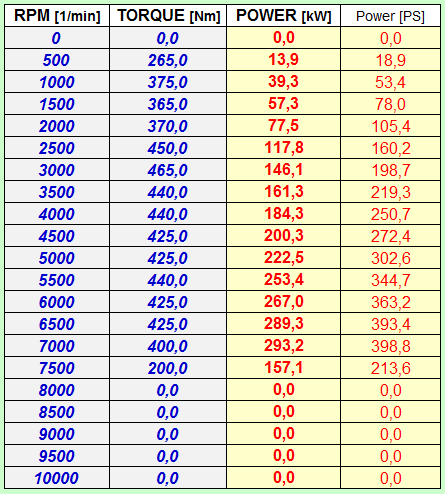 Drive Line Control Data can be entered. Next to the already mentioned Shift Time for each Gear an Up-Shift RPM can be set and the rev limit of the Engine. 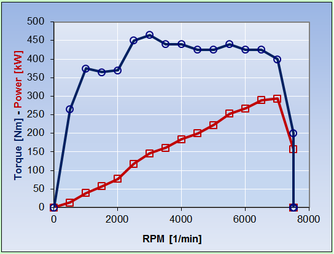 RPM drops are automatically calculated providing the numerical data for the Engine/Gearbox RPM Velocity chart. Additionally the clutch Stall RPM parameter allows to investigate and find the optimal engine speed for Performance Starts. The most important vehicle data are of course Vehicle Mass, Weight Distribution, Center of Gravity Height and Wheelbase since these parameters define the longitudinal load transfer and wheel loads under Acceleration. Additionally the tool considers the Aerodynamic Data, Tire Rolling Resistance and Road Gradient (included for Hill Climb Racing), since these are the limiting parameters of any Acceleration. It should be mentioned that the tool is fully capable of simulating high down force vehicles and considers the effects of especially high (negative) Lift & Drag Coefficients on acceleration performance. NUMERICAL RESULTS contain the most commonly known numbers that are being used in Performance Tests either related to Time or Distance. All points of interest can be varied without any limits as long as the maximum (simulation) time which is needed to achieve this condition does not exceed 1 minute. 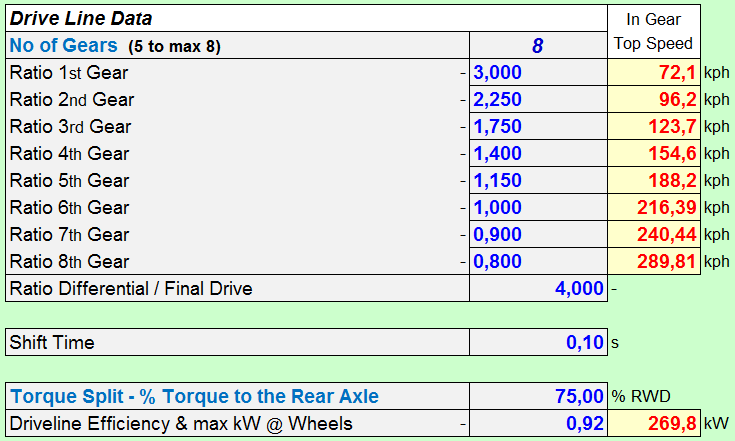 As a guidance the tool calculates automatically the theoretical maximum speed that should be achievable - solely based on the amount of Power available - which will help to identify any potential issues on the selected gear ratio's or final drive. The tool will also automatically calculate the maximum possible accelerations for FWD or RWD and the best AWD configuration (with corresponding Front to Rear Torque Distribution) in order to achieve maximum acceleration at a given speed. 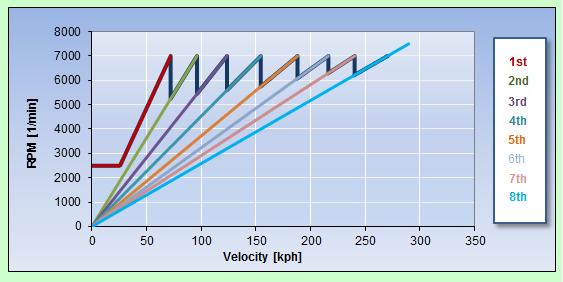 In the first Graph is the maximum Acceleration of the vehicle is plotted versus it's Velocity for each available Gear considering the limits of Tire Grip and the combined effects of Rolling Resistance, Aerodynamic Resistance & Road Gradient (which is for instance quite important for Hill Climbers). 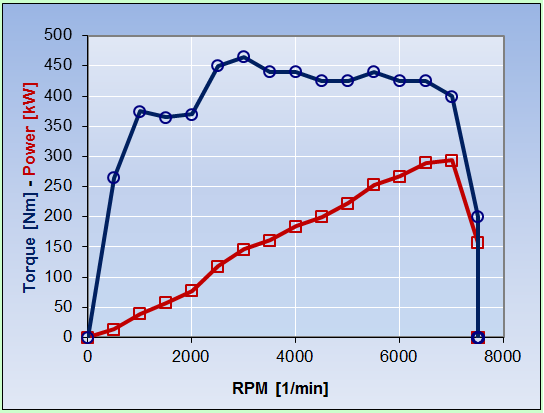 The second Graph plots the sum of all of these limiting factors into the Engine Torque Map allowing the user to see immediately whether the selection of ratio's is optimal or not. The remaining 6 other plots provide all visual information needed to complete the analysis of Vehicle Acceleration, Velocity and Distance. Since Acceleration vs. Velocity is a key metric, this information can directly be confronted with the Saturation of the Tire Grip, allowing to identify when wheel spin occurs (or stops) and what stall clutch RPM would give optimal traction in 1st Gear. 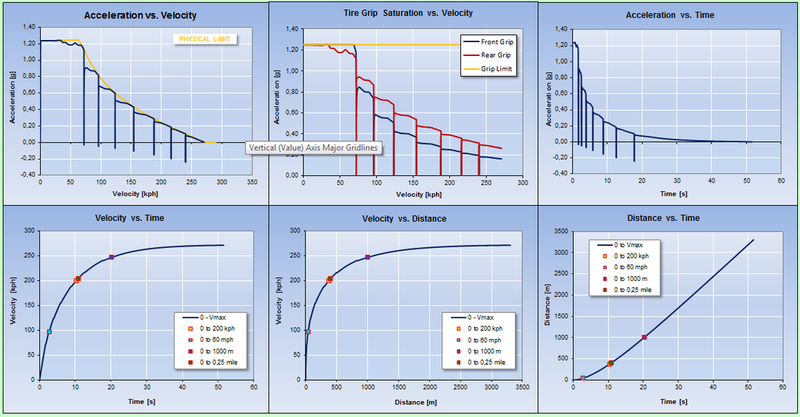 The workbook contains also a COMPARISON Sheet in which all key Parameters and Graphs for 2 Vehicles are listed allowing an easy back to back comparison of variants. Have a look at the DDM PDF file to find out more about it.